DUO is Le-Vel’s most cutting-edge and innovative product yet. That’s saying a lot considering the company achieved over $1 billion in sales in under 5 years, is said to be the world leader in human nutrition technologies, and has already brought cutting-edge nutritional products to market such as: the Thrive 8-Week Experience, Derma Fusion Technology, Sequential Gel Technology...the list goes on. DFT DUO is the next evolution of Derma Fusion Technology, offering a dual-action left/right adhesive application, resulting in a larger fusion footprint that provides a balanced release. DUO was designed to combine this innovative dual release/larger fusion footprint with DUO's enhanced weight management formula concentration to deliver greater absorption. DUO's purpose is to support lipid metabolism, providing all-day weight management and appetite support. This incredibly unique and effective product represents the next evolution of DFT from a technology, uptake, formula, and concentration perspective. Never before has there been a nutritional based weight management product as unique as DFT DUO. DUO is one step of the 3-step Thrive Experience – combine DUO with Thrive Premium Lifestyle Capsules and Thrive Premium Lifestyle Mix, and you will push forward towards your long-term weight management and overall health and wellness goals. 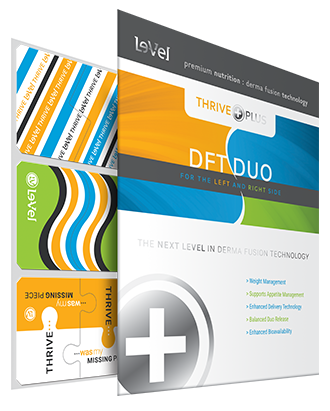 DUO is here – don't be left behind; join the millions of Thrivers experiencing the incredible results of DFT DUO.